On the north coast, which has the highest cliffs, the beaches tend to be smaller, wilder, with red sand and more quiet than the ones on the south. La Vall- Cala Algaiarens o platja d’es Bot is one of the exceptions of the north, with white sand. It is a large wide cove split into two medium sized golden sandy beaches, both have calm protected sea and are shallow, making it perfect for swimming. Directions: it only takes 15 minutes from the apartment. Head towards Ciutadella then at the entrance roundabout for Ciutadella follow the signs for Cala Morell. At the first roundabout turn right. The second roundabout is signposted for Cala Morell and Algaiarens, turn right following the signs. Continue along the road until it forks one direction for Cala Morell and the other for Algaiarens. Cala Pregonda-Pregondó is one of the most populars on the north coast. Medium sized golden sandy beach with clear inviting sea protected by the bay and the small island and beach opposite. Pregonda is a beach like no other on Menorca with several distinguishing features including the island in the middle, the golden rocky sea beds behind the island and its smaller sister beach to the east Pregondó. Platja Cavalleria is one of the biggest beaches of the north coast, with red sand, a system of dunes and nice panoramic views. A good option as well could be to visit the impressive Cap de Cavalleria, the northernmost cape of Menorca, with cliffs that rise 80 metres above the sea level, with spectacular sunsets; you can reach it from the beach walking along a trail or by car. Directions: it takes about 45 minutes from the apartment. From the main road across Menorca head towards Es Mercadal, then follow the signs for Fornells, then signs for Cavalleria. There is a 10 minute walk to reach the beach from the car park. 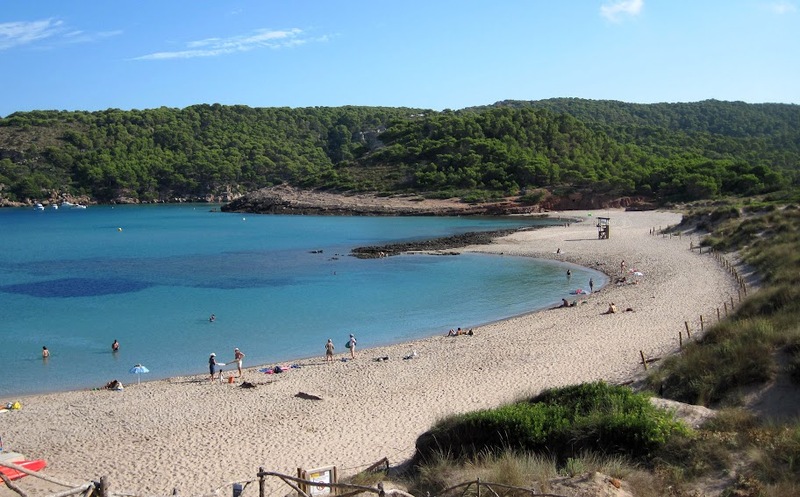 Cala Tortuga- Cala Presili, are medium sized unspoiled sandy beaches. Characterised by the variety of flat stones in shades of brown and grey at the back of the beach and the sand dunes behind it. Directions: it takes about 60 minutes from the apartment. From the main road across Menorca head towards Maó, before reaching Maó take the secondary parallel road (Me-7) towards Favàritx. Follow the signage indicating Favàritx which will lead to the smaller road (Cf-1) which you follow to the end. Find parking on the side of the road before the lighthouse, there is no car park. Once parked follow the sign along the Camí de Cavalls’ track which there is a turn off before the end for Cala Presili. Straight on leads you to Cala Tortuga. Easy walking track, flat almost the whole way. Approximately 15 – 20 minutes. On the south coast the beaches have fine white sand and clear turquoise water. The most picturesque images of Menorca’s virgin beaches come from the south coast. The most popular coves but the busiest, so get in early. That is the case of Macarella-Macarelleta, the most widely recognised beach of Menorca, stunning clear blue water in the bay with white sandy beaches and surrounding rocks with shallow waters. Macarelleta is the smallest and it can be reached walking from Macarella, the path has some of the best views on the island. Gets busy during the summer months so get in early. Highly recommended. Macarella has a chiringuito (beach bar) that serves an excellent selection of meat and fish with salad and chips amongst other plates. Directions: it only takes 30 minutes from the apartment. Head towards Ciutadella then on the ring road with the roundabouts on the outskirts of Ciutadella take the roundabout exit for ‘Sant Joan de Missa’. You will also see a large sign for the parking for the three beaches ‘Son Saura’, ‘Cala Turqueta’ and ‘Macarella’ at this exit. Follow this narrow road straight ahead round all the curves till you get to a distinct signposted fork in the road. Veer left towards Macarella. There is a car park but notice the sign beforehand indicating the free parking. From the car park to the beach there is a 15 minutes walk. Another option is walking from Cala Galdana, approximately 30 minutes following the trail along the coast known as the ‘Camí de Cavalls’. It is a good option if the car park in Macarella is full or if you are taking the bus from Ciutadella (number 52 Ciutadella-Cala Galdana). Son Saura-Es Talaier are less busy. Son Saura cove is one of the biggest in Menorca, with shallow calm waters that open out into a large bright blue bay surrounded by pines. Es Talaier is a paradise that can be reached walking 30 minutes from Son Saura or from the other side from Cala Turqueta. Directions: it takes 25 minutes from the apartment. Head towards Ciutadella then on the ring road with the roundabouts on the outskirts of Ciutadella take the roundabout exit for ‘Sant Joan de Missa’. You will also see a large sign for the parking for the three beaches ‘Son Saura’, ‘Cala Turqueta’ and ‘Macarella’ at this exit. Follow this narrow road straight ahead round all the curves till you get to a distinct signposted fork in the road. Veer right towards Son Saura and park in the free car park and walk to the beach. Mitjana – Mitjaneta considered one of Menorca’s most beautiful beaches, cala Mitjana is an open clear blue cove with high cliffs on either side offering a fantastic view. Mitjaneta is very small. Both get packed quickly during the summer, advisable to arrive early. A good option is to get in early and the go to Trebalúger, a 30 minutes walk on the coast trail with fantastic views from the viewpoint. Directions: it takes 25 minutes from the apartment. Head towards Ciutadella then follow the sign to Ferreries , then take the road to Cala Galdana, turn off and park in the parking for Cala Mitjana. The beach is a short walk from the car park. Another option is walking from cala Galdana, a nice 20 minutes walk, is a good option if you take the bus from Ciutadella (number 52 Ciutadella-Cala Galdana). Playa Trebalúger is a beautiful beach. Trebalúger is a pristine turquoise cove with a surrounding of pine trees backed onto a gorge and opening of a freshwater river. Directions: Head towards Ciutadella then follow the sign to Ferreries, then take the road to Cala Galdana, turn off and park in the parking for Cala Mitjana, from there it is approximately 30 minutes walk to Trebalúger.